Step into the sophisticated Hyatt Regency Bellevue on Seattle's desirable Eastside and let an air of elegant tranquility wash over you. Rich woods, natural finishes and luxurious fabrics set the tone for an exceptional guest experience. Fresh from a $185 million expansion that unveiled a stunning new guest tower and the addition of more than 53,000 square feet of event space, our Bellevue hotel boasts a premier location for both work and play. 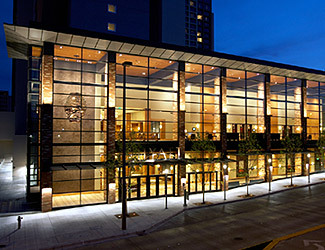 Just 20 minutes from Sea-Tac International Airport and nine miles east of Seattle, our AAA Four Diamond Bellevue Washington hotel serves as an anchor within the trendy Bellevue Collection. Stroll through connecting sky bridges and discover more than 250 shops, 45 restaurants and lounges and plenty of entertainment options harbored inside this chic urban streetscape. Whether you want to explore the nearby wine country or conquer the great outdoors, start your adventure at the luxurious accommodations, of the Hyatt Regency Bellevue. Click Here for Specials & Packages. Book Direct!